I held my second landscape painting workshop of the year in Joshua Tree during April, a beautiful time to be in the desert. Rain has been pretty sparse the last couple of years, so the annual wildflower bloom was pretty much nil in both the high and low deserts, but the cacti and Joshua Tree are pretty dependable for producing some showy flowers. I've been to the JT area numerous times, but there are always new places to explore and paint. Once you become familiar with different areas, you start to notice differences in elevation, plant life, and color. We began the workshop at Hidden Valley. I chose a few different locations throughout the high-desert section of the park that would provide different landscapes to paint - open vistas full of Joshua trees, areas packed with huge monzogranite boulders, and mountaintop views of the Coachella Valley and Salton Sea. Even the color of the soil varies from place to place. After painting all morning, the class would take a 3-4 hour lunch break to relax, heading back to hotels or into town for a sandwich. Though we didn't encounter too much wind or heat, the intense light really tires out your eyes, so a siesta is crucial. When we returned in the afternoon after a good rest, everyone was ready to jump back into painting. I began each afternoon session with another demo, same as the morning, and we would paint until sunset. The town of Joshua Tree is not that far off the beaten track (much more established than the sleepy town of Borrego Springs), so we would gather in the evening to eat at one of the good restaurants in town, chat about art, check email, or do a little grocery shopping for a BBQ. During Day 2 we painted in Lost Horse Valley in the morning and spent the afternoon at Quail Springs. I had initially planned for us to paint at Key's View, a spectacular lookout with views over the Coachella Valley including the San Andreas Fault, the Salton Sea, and San Jacinto, but after we arrived the wind nearly blew us off the precipice. We enjoyed the view for a few minutes before we retreated back down to lower elevations to paint. Our timing was perfect for nocturnes - the full moon was due to rise just a few days after the workshop ended, so during the workshop weekend a bright moon would already be in the night sky by the time it was dark. I had arrived in the desert a few days before the start of the workshop so I was able to paint a few nocturnes, but after painting all day during the class we just never had enough energy. There was quite an interest in trying to paint the moonlight though, so I'm going to be planning a nocturne-only workshop in the near future. Bookmark this page on my website for upcoming workshop news. After a very productive workshop and informal critique, we headed out for dinner at Pappy & Harriet's Pioneertown Palace, a must if you're going anywhere near Joshua Tree. They feature live music most nights and the food is awesome. The Santa Maria tri-tip BBQ is always hot, and the bowl of chili is amazing. A good evening to wrap up a solid couple of days painting in the Joshua Tree desert. I've just returned from a week of painting and teaching in California's Anza-Borrego Desert State Park. This was the second 3-day workshop I've taught there, and was excited to return. I love this part of the desert, and this trip afforded me a little more time to explore and paint a few new locations. I also painted a few more nocturnes on location, something that has to be experienced. Even with less than a quarter moon, color temperatures and shapes are apparent, and there is also starlight to see by. 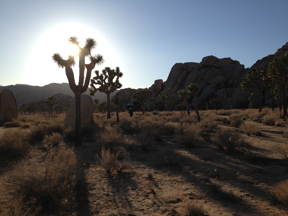 NOTE: If you missed this trip, I'll be teaching another 3-day workshop in Joshua Tree next month, April 19-21, 2013. Each day began with the importance of using your sketchbook - finding what your piece will be about, drawing thumbnail sketches and writing about them. I'm not interested in copying the landscape, but rather finding what it is that excites me about the location. I see painting as a way to dig a little deeper, to try a little harder. I began with a demo in the morning and did another after lunch. I want everyone in the workshop to come away with a structure or process that they can use to interpret the landscape when they're working on their own. We talked about color, value, shapes, materials, umbrellas, and many other items of concern to artists working outdoors. We started early each morning while it was still cool, painting until 1 pm or so, and then took a 2-hour lunch and siesta. After the rest, we'd get back out on location for the afternoon. For most folks who haven't painted on location before, one thing they don't realize is how physically and mentally demanding it is. This trip also sprouted a new tradition of starting the afternoon session with ice cream. At the end of a full day of painting, we'd gather for a good dinner at a local restaurant to relax and discuss painting. I selected three different locations around the park that provided three different types of landscape, with a variety of underbrush, cacti, and change in elevation. On the last day we created a little shade and held a critique to talk about the work everyone had produced. I'm always glad when I see such a sharp improvement over a short period of time, and there was a notable jump in seeing and painting color in each student's work over the three days. Though we were pretty tired when we departed at the end of the workshop, I think everyone seemed pleased with their efforts and had a sketchbook full of new ideas to put into practice in their own future work. I'm pleased to announce a new gallery I'll be exhibiting with, Egeli Gallery in Provincetown, MA. They've got a great roster of artists in the gallery who have a deep interest in working with color, so that's exciting for me to be a part of. The Egeli family has a great artistic tradition that covers at least three generations of artists, and more than one generation studied with Henry Hensche, a noted artist of Provincetown and student of Charles Hawthorne. Egeli Gallery opens April 25 for the summer season on the Cape, and you can visit them at 382 Commercial Street, Provincetown, MA 02657, 508/487-0044. As featured in my March 2011 eNewsletter - click the image for a larger version. To make sure you receive the eNewsletter with the latest info, send me an email. Painted on location in Pasadena's Arroyo Seco, this is a popular place for joggers, dog-walkers and equestrians. On this spring evening, though, everyone seems to have departed as the sun sets on the far side on the arroyo. These (painting) situations with lots of color variations within a close value range are a favorite of mine. I was recently invited to join a small group of artists to paint on Tejon Ranch, 270,000 acres of protected open space located about an hour north of Los Angeles. A private ranch since 1843 used for raising cattle (and in recent years, film productions from Los Angeles, check out this page for photos of the Ranch), it has all sorts of varied landscapes from snow-covered mountains to joshua trees to fields of poppy and lupine and hillsides covered with a woody bush with yellow flowers something like a coreopsis. From what I understand, we were the first group of artists allowed access to paint there (though artist Charles Muench was the first to work there in 2008). "The California Art Club and the La Casita del Arroyo Foundation join forces for the fifth exhibition and sale of plein air paintings of the Arroyo Seco, Southern California's most celebrated canyon." "The exhibition will feature new original artwork by renowned contemporary-traditional fine artists who will paint on location during the week prior to the exhibition to document the environmentally-sensitive Arroyo Seco, which includes the historic Colorado Street Bridge. Proceeds from the sale of the paintings will benefit the California Art Club's educational arts programs and La Casita's conservation efforts." I recently sneaked away for a week of painting up in Big Sur, the absolutely amazing coastline between Monterey and San Luis Obispo. After a hasty packing and evening departure, I arrived in darkness and heavy fog just before midnight and set up my tent at the Kirk Creek Campground amidst a number of curious raccoons. I met artists Andrew Dickson and Joe Forkan at the campsite there, as they had arrived a few hours earlier and were already settled in. We painted up and down the coast, often just walking down to the water from the campground. I love the atmosphere there; it can go from a sunny afternoon to cloudy in minutes, with heavy fog banks rolling in off the coast. These are a few of the sketches from the trip. On Sunday, October 25, I'll be painting with the Valley Artists Guild at Topanga Canyon State Park from 9:00 a.m. - 1:00 p.m. The Valley Artists Guild was founded in 1948 by the sculptor Henry Van Wolf (1898–1982). If you're in the area please stop by and join us. Check out their October Newsletter. The new Fall schedule begins soon at the Los Angeles Academy of Figurative Art (LAAFA). If you've been wanting to sign up for the landscape class, this is your chance. It runs for 8 consecutive Saturdays beginning this weekend on October 3 from 9:00 a.m. - 1:00 p.m. Visit their website or call 818/708-9232. More class info here. These classes will show you how to paint what you see, not what you think you see. Learn how to interpret nature in terms of paint, using light and color to create form. Become more proficient at mixing and painting color relationships, design/composition, simplifying, gain from painting on location, as well as creating a painting that has something to say. Make an investment in your art – gain confidence and knowledge that will inspire all areas of your creativity. All levels of experience are welcome.